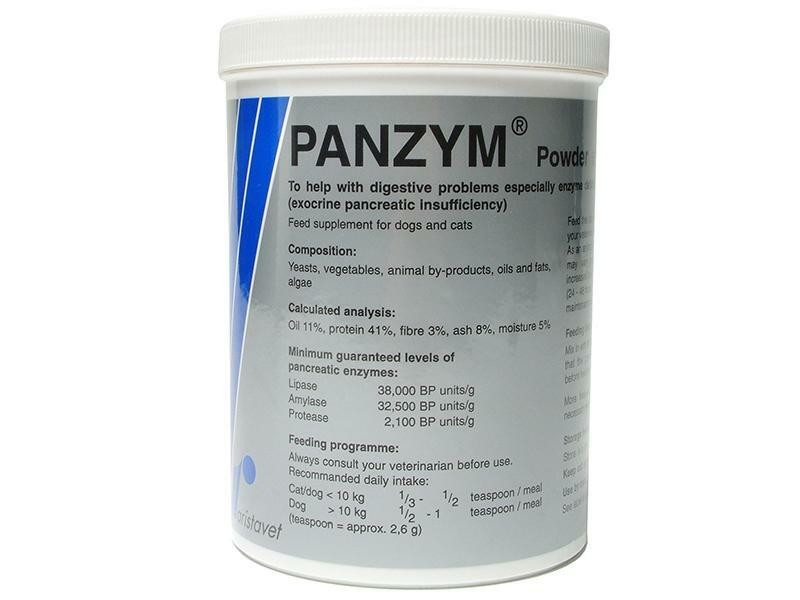 Panzym Concentrated Pancreatic Enzyme Powder is an effective and powerful feline and canine pancreatic supplement. In a dry powder form, Panzym Concentrated Pancreatic Enzyme Powder should be sprinkled on moistened dry food so that it sticks. Panzym Power is a pancreatic supplement for cats and dogs. As this product is in powder form, it should be mixed with food, moistening dry food slightly, so that the powder adheres to the food. Below are some recent questions we've received regarding Panzym Concentrated Pancreatic Enzyme Powder, including answers from our team. Hi, I'm looking to buy this product (170g) for my dog who has recently been diagnosed with EPI. He's about 6.8 KG. I wonder how long it'll last if I use it according to the label, 1/2 teaspoon twice a day. Thanks. A teaspoon of Panzym weighs apprroximately 2.6g so at a dose rate of half a teaspoon twice a day the 170g tub will last around 65 days. Yes it is perfectly fine to give probiotics with this this supplement and is a good idea with this condition. This product works directly on the individual meal it is given with, enabling the dog to digest this particular meal more effectively. It requires to be given in an adequate dose to do so. Therefore you should see some improvement in the faeces produced within 24 hours. There can be other complicating factors which prevent the digestion from being perfectly efficient as quickly as this, but your vet could advise you if any other measures are needed. It will obviously take a while for the average patient to put weight on, depending on lots of other factors. Usually some difference is noticed within 7-10 days. My dog is struggling on Renal wet food-she will eat some of the dry food which we are treating as treats - do you think this powder will help as at the moment she is having senior food + the little dry renal Royal Canine + 3 ant acid tablets 3 times a day. Is this worth a go or should I consult my vet first? Regretably this product is not likely to help your dog I feel. It would not do any harm, but unless your dog has a digestive enzyme deficiency (which is not typical with pancreatitis) then it is unlikely to help. I would expect that any of the renal foods should be suitable and it is very important that she is eating enough for her daily requirements, so if she will not eat the ideal food, it is better to allow some less than perfect food than she loses more weight through not eating. Hill, Royal Canin and Purina all make good foods suitable for dogs with chronic kidney disease and failing kidney function. If this is what your dog is suffering from (+/- pacnreatitis) then I would suggest trying a variety of any/all the renal foods, wet and dry. Obviously check this with your vet who will be more familiar with your individual dog, but generally speaking the above applies. There are some other supplements which can help dogs with chronic renal failure, such as Pronefra and Rubenal so I would suggest looking at those too.